Remember when I said I wanted one of these? I’ve finally replaced my trusty (but not rusty) 12” G4 Powerbook with a shiny new black Macbook. It is every bit as amazing as I thought it would be. It’s nice to have the performance breathing room to do the things I want without the computer getting in my way. I haven’t had a black computer since the G3 Powerbook I had about five or six years ago. My Powerbook will be going up for sale. If I had a budget for a comp, I’d inquire. As it is, the Pentium III PC I snagged off Craigslist for US$45 is doing just fine. Ooooh. P3. Thats serious horsepower dude. 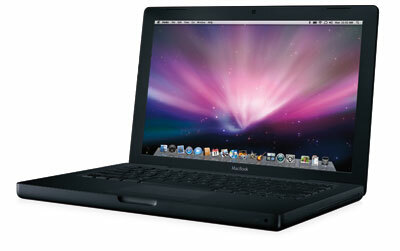 I am not sure what the Powerbook will be selling for, but I’ll post on this site when I have decided. But if your computer is doing fine, then one doesn’t need anything more. The Powerbook just wasn’t doing it for me any more. The ability to run Windows and OS X on the same machine at the same time was a HUGE issue for me as a web developer. The Mac is a beautiful toy, but I object to Apple’s corporate philosophy. Use FreeBSD, or Linux. Or something. Personally, I use Debian Linux and Ubuntu Linux. One man’s toy is another mans tool. I can’t run Photoshop or Illustrator or InDesign on FreeBSD or Linux. I can’t run Logic on it either. I can understand objecting to Apple’s corporate philosophy, though I also point out that you brush past that and don’t address exactly what you disagree with. For me personally, I have no issue with any of Apple’s corporate philosophies, and in fact hold one of them close to my heart: The computer should enable the user. In terms of hardward, I think many people dismiss the industrial design of Apple’s products as “pretty” or (as you said, Jon) “beautiful”. Yes, they are beautiful machines, but above that, they are exceedingly usable machines. To each their own. I don’t begrudge you your Debian or Ubuntu (I’ve used both, both found wanting for my purposes). I suppose you’re right. For those who need to use serious professional software, Debian and other Linux distros can’t compete. As far as a choice between Microsoft and Apple, there is no choice. Apple wins, hands down. Since my computer use really on amounts to noodling and srcewing around, I suppose I can afford to have unreasonably lofty principles. I concede that the MacBook is an excellent machine (as are virtually all Apple products). Or I have “Mac Envy”. You let go of the flue, huh? I met Frankybonz last fall. then he replaced my HD and tripled my ram. and a few other bells and whistles. want to come over & play? p.s. we have two members who’d love to have a Mac. One is in Nova Scotia and the other in Romania. How much to get it to Nova Scotia? Congrats Adrian, I have had my black MacBook for a little over a year now, I love it, I went from a 15 inch Power book, I use my Pbook now mostly to view DVD movies d/t screen real estate, I have done some cool PS designs on my macBook , Oh i still have an original white ibook G3 10HD and it still works :). Since the macbook pro line does not have a 12’‘ size anymore the macbook is great substitute d/t it pack well for travel or just out and about. hope you are well and all and congrats again. Hey Adrian. Its been a while man but I stlll have you in my RSS feed reader. I recently got a new mac too. I went for an MBP. Man does it fly compared to my 700mhz g3. Have fun with it and get in touch, its been ages. I’m always here, you guys know where to reach me. I am loving my Macbook though. Just loving it. For what it’s worth, I have considerably less trouble with my P III machine running Slackware and a very minimal GUI environment (read: no Gnome, KDE, or XFCE), than does my wife who runs a 1.83GHz Intel Core 2 Duo iMac. That said, I certainly envy the sleak, sinewy muscle of a newer, finely-tuned machine. I’d love to try a nice GUI with the console underneath, all developed to work nicely together, taking advantage of that muscle. If OS X could be that (oh, and if I had cash to spare), I’d look into one of these machines, too. However, the way iPhoto breaks the “just works” credo for anyone but the most placated point-and-clicker (i.e. for anyone who might want to work with the image files directly and not through iPhoto’s UI) makes me cringe. My wife and I hunt around her harddrive looking for certain image files, for instance, to upload to Flickr, and it’s something of a chore. Give me the responsibility to organize my own photos without “smart” software to do it for me. Granted: we/she could do that anyway, and not import into iPhoto; but since it’s bundled with the OS, there’s an implicit compound statement of “We provide for a wonderful user experience,” and “This is our definition of ‘wonderful’.” You can’t help but wonder what else is similarly wonky under the hood. Or, maybe you can. iPhoto (as I just said earlier today to Sarah) is the red-haired step-child of the iLife suite. It’s complete pants, that iPhoto.